Artisan Travel’s summer bookings to the Nordic countries more than doubled last year, reflecting Sweden’s 8% visitor-number increase, Norway’s 6.6% and Finland’s 16% increase in recent years according to The World Bank & World Tourism Organization, Yearbook of Tourism Statistics. A pleasant climate: Scandinavian summers enjoy average temperatures in the low 20s in the peak summer months of June, July and August, so it’s warm enough to enjoy the outdoors without the downsides of the intense Mediterranean heat. Currency: Although the pound has plunged against the Euro recently, it has held reasonably firm against the Krone/Krona in Norway and Sweden – losing just 5% in value vs around 20% against the Euro – so you’ll get good value from your holiday budget. No crowds: Scandinavia is a big place, with modest populations interspersed with large areas of countryside, forest and wilderness. There is a huge coastline with thousands of islands to explore, plus some stunning beaches and sea views – but the interior also features thousands of fresh-water lakes which are excellent summertime holiday destinations. All come without the crowds. Lots of daylight: Famously, within the Arctic Circle, the Midnight Sun means it’s possible to pack much more into each day. In the peak months, when the sun never sets, the landscapes are bathed in a beguiling golden light, providing the perfect setting for swimming at midnight or foraging in forests for nuts and berries. The great outdoors: All the above means visitors get to spend much more time outdoors, with innumerable activities to enjoy. The scenery is stunning and the space is generous. There’s hiking and walking, fishing, wildlife spotting and photography plus kayaking, cruising and exploring along stunning coastlines. Simply exploring villages and countryside in your own time on a self-drive holiday, with uncrowded roads, is hugely pleasurable. 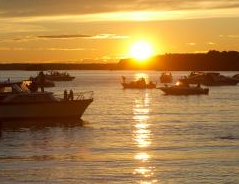 Here’s a selection of popular Nordic Summer Holidays from Artisan Travel. At Iso-Syöte you can make the most of the lakes, hills, trees and fells in the magical light and enjoy the environment in a variety of ways from canoeing and fishing to Nordic walking. 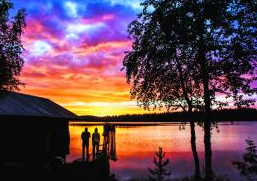 With a choice of either a hotel or log cabin accommodation upgrade, and the opportunity for a unique night at a sled-dog centre, this holiday provides everything for a great summer adventure in Finland. Six nights from £1,025 pp (two sharing) including five nights’ hotel and one night’s Husky Farm accommodation, half board plus two lunches, guided activities (canoeing, Nordic walking, meeting the huskies and forest hike, plus fishing trip) and airport transfers. This wonderful itinerary combines the opportunity to experience a fabulous wilderness lodge with learning about the local flora and fauna. As an added highlight, you will be accompanied by an expert photography guide who will help you capture all of the Lappish beauty under the Midnight Sun on camera during this short break in Finnish Lapland. Three nights from £895 pp (two sharing) including three nights’ wilderness lodge accommodation, full board, guided activities (two Midnight Sun photography workshops, wilderness lodge hike, fishing and berry picking), flights (Heathrow) and airport transfers. Northern Norway offers it all: dramatic mountain views, scenic forest trails, fjords and ocean activities. All can be experienced on this self-drive adventure, with accommodation that also offers unforgettable views of mountains, fjords, harbours and the sea. There is also the opportunity to add a kayaking trip in Senja and try Stand Up Paddling in Sommarøy. Four nights from £750 pp (two sharing) including four nights’ B&B, car hire and full route details. This trip to the majestic Norwegian Fjords is designed to highlight the best parts of this picturesque area whilst taking part in some truly amazing activities. Sail on a small ship into the heart of a stunning fjord and kayak in the tranquil and wildlife-rich waters that surround Ålesund – itself a vibrant, beautiful town filled with Art Nouveau buildings, delightful cafés and fabulous restaurants. Six nights from £1,025 pp (two sharing) including six nights’ B&B, activities (a cruise into the Hjørundfjord with lunch, plus sea kayaking in and around Ålesund) and airport transfers. 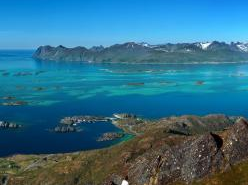 Discover the immense variety of the world’s biggest island on this grand tour of Greenland. Enjoy the beautiful and lush south with its fascinating Viking history, take in Nuuk, a modern capital in a traditionally Inuit society and Ilulissat, the town of icebergs and also a UNESCO World Heritage site. The cruise visits the Westman Islands and ends in Reykjavik, the coastal capital of Iceland. Led by talented photographer and guide, Fredrik Broman, this nine-night trip mixes an enticing array of activities with some of Scandinavia’s most innovative accommodation. Try glamping at The Aurora Safari Camp – itself the brainchild of Fredrik Broman, sleep in the trees at Sweden’s renowned Treehotel and put in to practice Fredrik’s expert photography tips. The trip will provide endless opportunities to witness the Midnight Sun from behind and in front of a lens, coupled with activities galore in northern Sweden and on Norway’s rugged coastline. Nine nights from £4,025 pp (two sharing) including nine nights’ accommodation, all meals, guided activities (rafting, Sámi village and reindeer visit, expert photography tuition, evening Midnight Sun drive, ICEHOTEL® visit, hiking in Abisko National Park) and airport transfers. 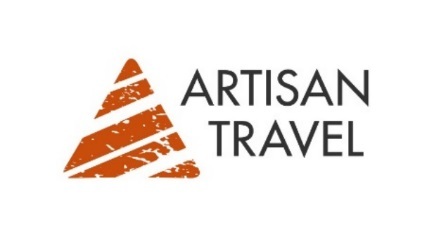 For individual trip inclusions, please see the direct page link to Artisan Travel’s website (www.artisantravel.co.uk) for each holiday listed. Note to editors: Independent specialist holiday company Artisan Travel provides life-enriching holidays, crafted by experts, which marry expertise and local knowledge to deliver unforgettable bucket-list experiences for adults. It is a sister company to family travel specialist Activities Abroad, and Northern Lights specialist, The Aurora Zone.